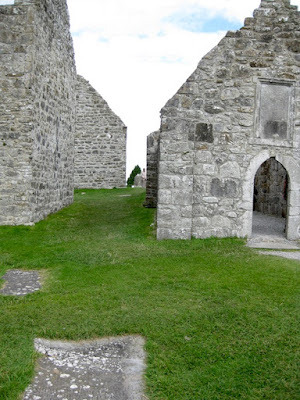 Across the Shannon, in the eastern part of County Galway, lies the historical townland* of Clonfert (As Gaeilge "Cluain Feart" meaning 'meadow of the grave') which formerly had one of the many Celtic Christian monastic settlements of the 5th/6th century. 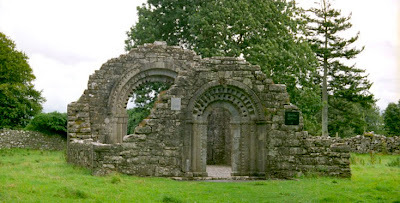 Today all that remains is a lovely, small cathedral whose founder was Saint Brendan the Navigator; it is said to be the oldest living church in Ireland with an unbroken history of public worship. The Cathedral of St Brendan with its' monastery college was founded in the 6th century and flourished for hundreds of years, suffering many raids by the Vikings who frequently sailed up the River Shannon from Limerick. It was burnt down in 1016, 1164, and again in 1179. The monastery and most of the church were destroyed in 1541 and the monastery was not rebuilt after this final assault. Prior to the destruction of the monastery college in the early sixteenth century it flourished with as many as three thousand students being educated here at one time. 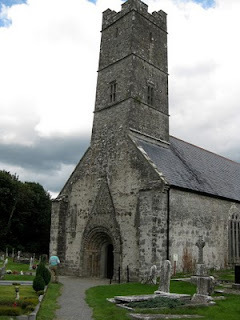 Recorded in a state paper of Queen Elizabeth the First is a proposal to found a University at Clonfert, it being a celebrated seat of learning in the centre of Ireland and a convenient place for Irish students. The proposition was rejected however and Dublin obtained the Charter leading to the foundation of Trinity College Dublin in 1592. It is here in the cathedral, on the entrance to chancel, that we discovered the mermaid. About 10 inches high she is complete with comb and mirror and has been rubbed to a shine by visitors. 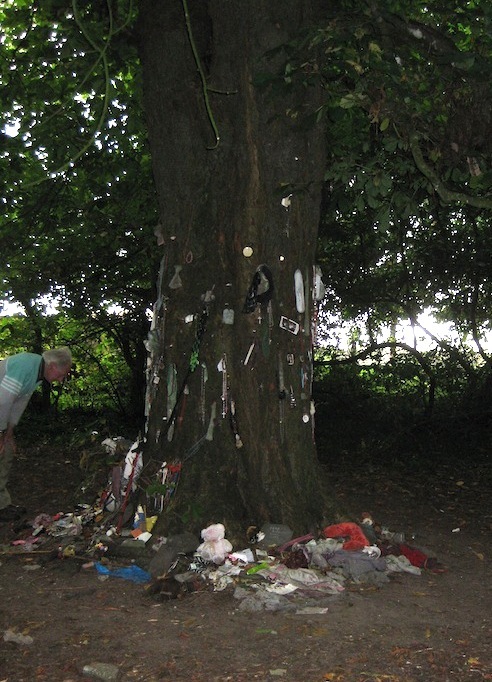 Next to the cathedral lies a small woodland and we stopped to pay a visit to the rag tree where people leave offerings to their god(s) in the hope of cures and the fulfilment of wishes or prayers. We travelled south of Clonfert and across one of the few Shannon bridges to the ancient town of Banagher ( Beannchar na Sionna meaning 'place of the pointed rocks'), County Offaly. From here the 'big eared lady' is about 3km away though not visible from the road. 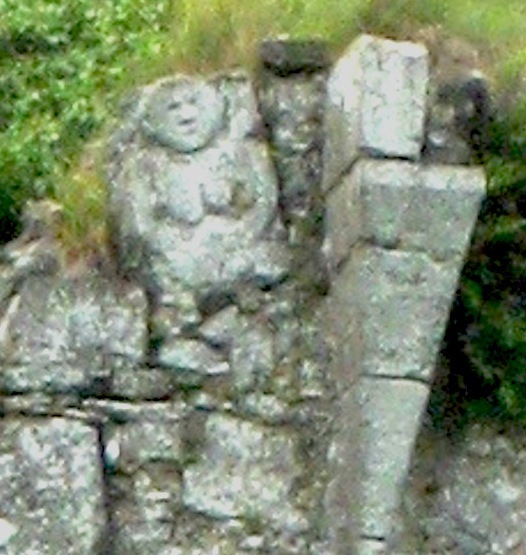 She is a Sheela na Gig sitting 20metres up on the end wall of the ruins of Garry Castle whose ancient owners, the MacCoughlans, had many strongholds in the area. wishing to conceive and are often known as hags or the witch on the wall. Townland: is the smallest geographical unit in the Irish census returns and are still in use today. Anything from 5 to 30 townlands may be grouped together to form a civil parish. A townland can vary in size from the smallest, of less than an acre to over 7,000 acres (an average size is 200-400 acres ) There are over 62,000 townlands in Ireland and are generally named after natural or geological features. 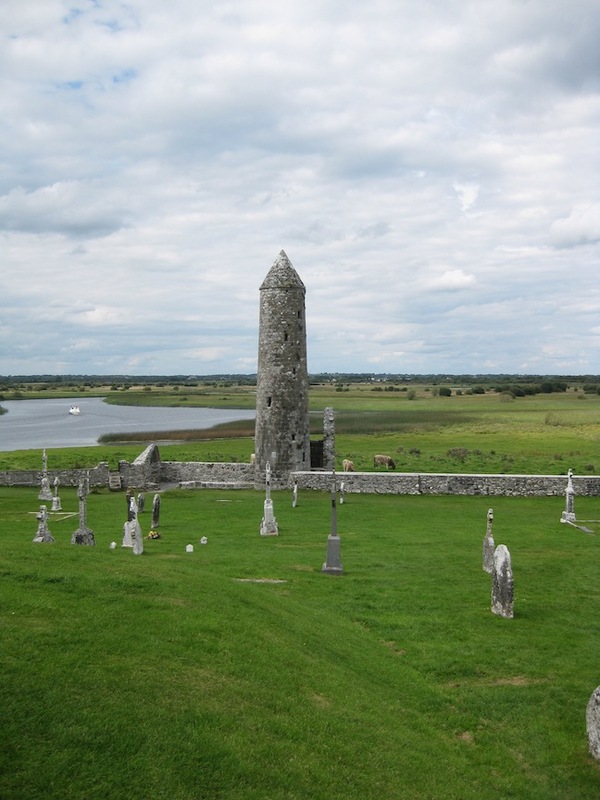 The jewel of Clonmacnoise sits about a quarter of a mile north, beyond the boundary of the monastery, with easy access via the modern cemetery leading to a narrow road. Walking this road we were very fortunate that it was a fine dry day, for it allowed us to take note of what was around us and our friend Fred (who is often seen on this blog) said 'Hey is this a ballaun stone?' We stopped, looked and were not totally sure. The words from a former job came into my mind - "investigation will reveal". So I knelt down and dug with my hands into the soft earth at the roadside to clear half of the debris away, then to feel gently under the remainder to find smooth stone, this was indeed an unmarked ballaun stone. With my hands in the mud trying to discover whether this was a ballaun stone. I was thinking on whose jacket I was going to wipe them if this just a stone drain! 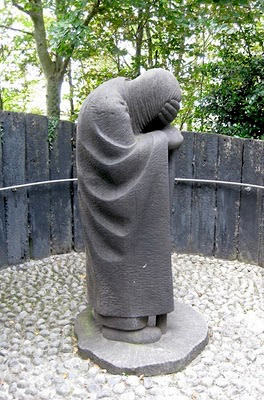 The story of Dermot MacMurrough during the Anglo Norman conquest of Ireland resembles a soap opera, pitting the wily, deceitful villain (Dermot) against the well meaning but hapless incompetent (Tiernan O'Rourke). MacMurrough and O'Rourke were mortal enemies. The antagonism between them dated to 1152, when O'Rourke had been humiliated by MacMurrough's abduction of O'Rourke's wife, Dervorgilla. But MacMurrough may not have been as culpable as it seemed. For according to Irish folklore, it was Dervorgilla herself, then aged 44, who arranged the abduction, with MacMurrough, aged 42, simply going along. Nevertheless, MacMurrough was hardly an innocent bystander, having eagerly accepted the invitation, and having staged a realistic abduction, with horsemen and screaming victim. O'Rourke recovered Dervorgilla the following year (1153), but he never got the revenge he wanted. The subsequent hostilities between O'Rourke and MacMurrough were played out in the context of a larger battle between Rory O'Connor and Murtaugh MacLochlain for the high kingship of Ireland. O'Rourke was allied with O'Connor, the eventual winner, while MacMurrough supported, and more importantly was protected by, MacLochlain. In 1166, finally, after a 10 year war, O'Connor defeated MacLochlain once and for all. O'Connor was magnanimous in victory. He reduced MacLochlain's petit-kingdom to a small area, and took hostages, but otherwise permitted him to live out his reign. O'Rourke had no intention of extending similar generosity to MacMurrough. He got his revenge later that same year when MacLochlain (MacMurrough's long time protector) died, and O'Rourke, along with several cohorts, forced MacMurrough to flee Ireland. But MacMurrough quickly regrouped. He sought help from Henry II, the aforementioned Norman ruler of the Angevin empire. To Henry, MacMurrough represented opportunity knocking. Henry had no enthusiasm for personally leading an expedition to Ireland but he had nothing to lose by encouraging MacMurrough. Thus Henry issued an open letter to his subjects, authorizing them to render military assistance to MacMurrough. MacMurrough then contacted one of the great Anglo Norman leaders in Wales, the legendary "Strongbow" Initially, Strongbow was reluctant, but then MacMurrough offered Strongbow his eldest daughter, Aoife (Eva), in marriage, together with the right to succeed MacMurrough as king of Leinster. Finally, Strongbow agreed to lead an army into Ireland to restore MacMurrough to power. The consequences of the above: led to the British occupation of Ireland for nearly 800 years ! 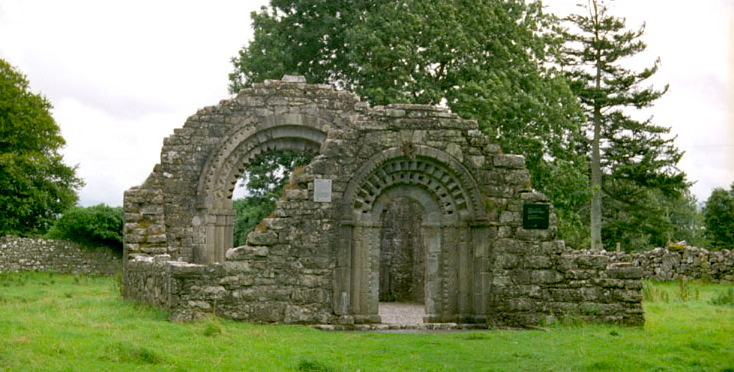 Dervogilla died at the age of 86 in Mellifont Abbey, Co. Louth. This was my first ever visit to the Nun's Church as I only knew about it from reading a novel even though I had visited the ruins of the monastery many times before. The church doesn't seem to be as popular and even on that day the number of visitor's could be counted on one hand. Beyond the hedge on the right hand side of the road there is a long mound, which I feel may well have been an ancient dry route that connected the two sites in times of flood. I refer to the Nun's Church as a jewel because of the 'energy' that is so very tangible there, in such places I feel and leave invigorated. I enjoy re-visiting places where the 'energy' strengthens my inner being and this is the only church that has done this for me. 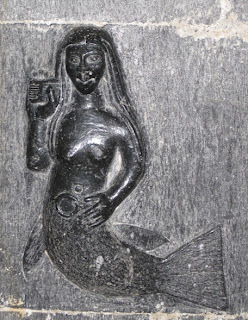 In part 4 we cross the River Shannon to visit a mermaid and later we meet a big eared lady. The previous blog about Lough Boora Parklands and the next four blogs (including this one) are of places that we visited on the same day. Moving from the bog lands of the big sky at LBP our route took us across open countryside and along straight, narrow roads that seemed to last forever. We chose to have lunch in Ferbane, the largest, small town in the locality where The Black Boot Restaurant catered for our needs. Mine were simple: a large pot of tea which provided me with several cupfuls, followed by a dish of jelly,custard and cream. It was delicious. My companions made up for my meagreness and had a decent sized lunch each. Our next destination was the ruins of Clonmacnoise, an ancient monastic settlement that sits on the banks of the River Shannon and where, in my mind, the river becomes a serpent as it twists first one way and then another. 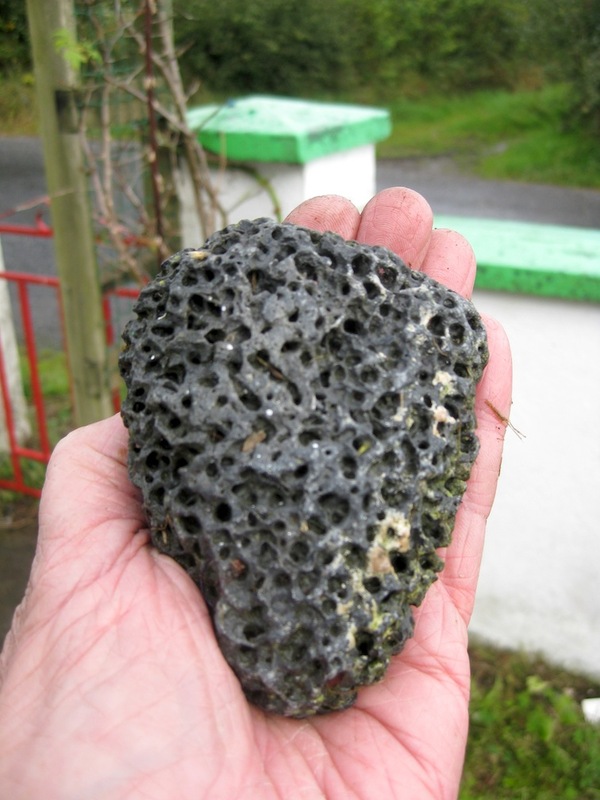 From the Shannon Pot in County Cavan through thirteen counties of Ireland the river travels 390km to enter the Atlantic Ocean in the Shannon estuary. The Shannon Pot, in the shadow of the Cuilcagh Mountains, has a famous legend: A granddaughter of Manannán mac Lír visited the mystical pool to eat fruit from the forbidden tree, or The Tree of Knowledge, which was planted by the Druids. As she began to eat, the waters of the pool sprang up and drowned her. The name of this young woman was Sionainn, Goddess of the River Shannon. Senuna is her earlier name meaning 'the old honoured one'. On approaching Clonmacnoise, from the Shannonbridge direction, we first saw the toppled ruins of an Anglo-Norman castle built in 1214. It was the second such structure here and replaced a wooden castle destroyed by fire and possibly by Viking marauders. The primary function of the castle was to enable the Anglo-Normans to gain control over the midlands and guard an adjacent bridge which spanned the Shannon. This castle too was destroyed in the late 13th to early 14th century. The pilgrims to Clonmacnoise would mainly have walked or have rode on their small horses. All around Ireland at the ancient monastic sites round towers are to be found, some are very well preserved others are not. As to why they were built there are as many ideas as there are towers. The monastery was founded between 545 & 548 AD and built in wood, these were replaced with stone buildings in the 9th century. Its' greatest period of growth came between the 8th & 12th centuries during which time it was attacked frequently mostly by the Irish (at least 27 times), also by the Vikings (approx. 7 times) and the Anglo-Normans (approx. 6 times). Well preserved ruins of chapels & churches. 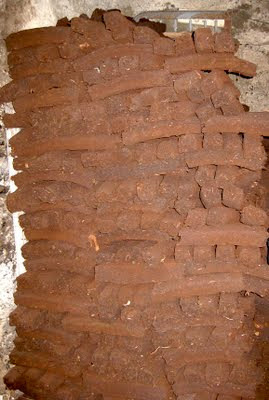 Once again ideas abound on what the original use was wether it was for the grinding of grain or for toning. Though certainly not as a wishing well as can be seen here. On a personal level I abhorr the idea of throwing coins into water from which humans or animals might drink from and become poisoned. for on the opposite bank is Co.Galway. Close to the monastery is what I feel is the 'jewel in the crown' and it is that gem that the next blog will be about. 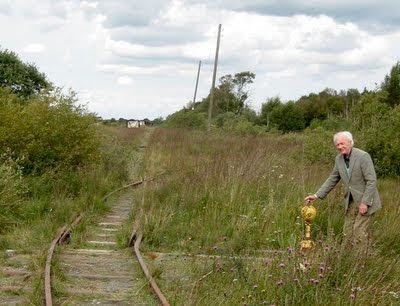 Following on from the previous blog about turf it seemed right to show one of the uses of bogland after commercial exploitation has finally ceased. The Lough Boora Parklands of 5,437 acres, being a particularly good example of providing a public amenity for all age groups at different levels of interest; consisting of Finnamore Lakes with it's fishing & birdlife, a sculpture park, a mesolithic site and Farmland. On the day that we visited the weather was just right, for Boora is a vast area and ideally it needs to be nether to hot or cold. We chose to walk although bicycles are for hire, some of the bikes are equipped with small buggies for children to sit in. I was hoping that they would have one I might fit into but no such luck ! Boys of all ages like to play trains given the chance..
pulled trucks loaded with turf. Above is the remains of that trackway and if you enlarge the picture you will see the trucks, that remain here as silent sentinels. As we walked my eye caught on a strange building, that in the distance appeared to be a stack of grey logs. It was only as we got closer that a triangular shaped, strange roofless structure appeared in front of me, my curiosity was heightened as to what exactly it was and so the camera came out to make a capture. A place to dwell within and view land, sky or both. A notice board close to this practical piece of art invited the reader to sit within and experience a different energy. The walls are made of blocks of bog oak trees cut to shape. 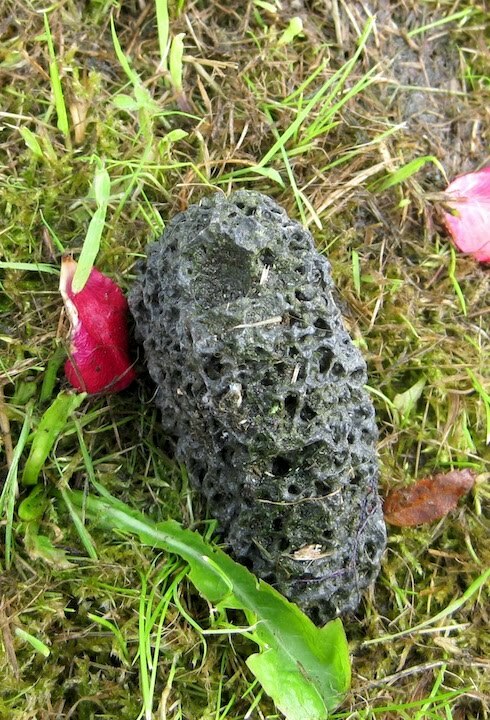 The wood preserved in peat that had been retrieved from the bog. Can be as much as three and a half thousand of years old. The happy person seen inside is relatively young. I appreciated these words & felt the desire to share them with you. Just a few of the sculptures. 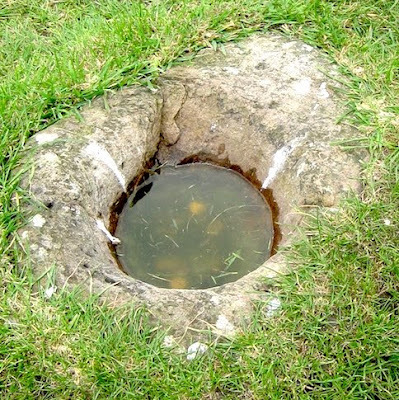 The water in this drain seemed to be devoid of fishy creatures, for none of the usual signs were at all apparent, as per rings on the surface of the water. I was all but convinced, until a large Heron or perhaps it was a Crane flew over our heads to landed on the bank and then we knew that this fisher bird only visits for food. A viewing place from which to view the birdlife of the lakes, without causing any fright to flight for them. The hide is made of wood, open viewing slits and a reed thatched roof. Access to the hut is via a bridge on stilts that sits above the marsh grass. Inside: the conical point of the roof had been used by swallows, for a heap of their guano could be seen on the floor directly beneath the nests. We will return again to The Lough Boora Parklands and visit the mesolithic site and perhaps to see many more of the sculptures that we missed. We shall however use bicycles next time and save the poor old feet. It's that time of year when a load of dry hard sods are delivered to our yards from the bog and tipped handily to where it is going to be stored. This year we had a three tonne load which meant placing it in two small sheds. Fortunately a friend from a neighbouring county arrived unexpectedly and the job was completed more rapidly than it would have had we been on our own. A dusty, warming job that tests the muscles as we bend to pick up each piece, then turn and stack it to roof top height. Before reaching us men in the shed Mrs H had picked up the sods put them in a wheel-barrow and tipped them at our feet. 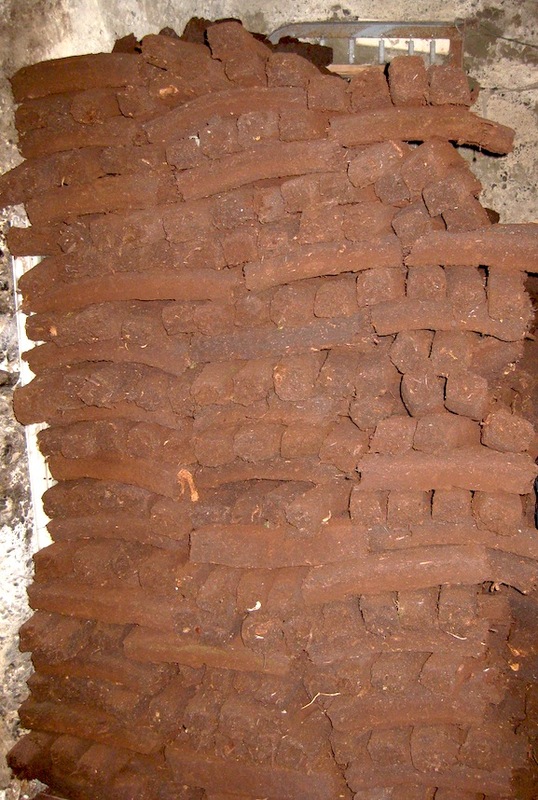 Prior to that the people on the bog hand handled each piece at least four or five times between the drying process and the delivery. Finally from the shed to the fire they will be hefted twice more; so all in all, I calculate that each will have been handled at least eight to nine times! 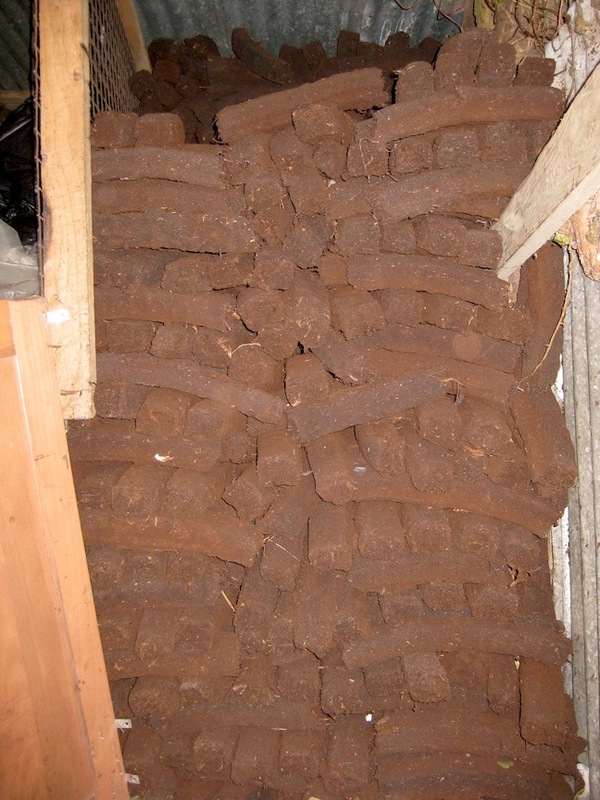 The heat from turf (peat) is luxurious, the very distinct aroma as it burns is homely and in the winter on cold frosty nights, if you walk the roads it is to sense a welcome in the air; a similar sensation to the burning of wood smoke, for it conjures up warm comfortable images ! You can think of us pair warming our toes with the dog at our feet, the cats perched on the settee snoring. While Mrs H and I sit nursing a glass of homemade damson brandy each and a honey waffle in the other hand. At times I seek out places in nature away from the maddening crowds where I can find peacefulness, rare spots on the coastline or in the countryside which provide none of the usual trappings of modern life. There are many that I have become accustomed to visiting and one which I will share is at Rine in Co. Clare, the approach is an awkward drive along a narrow boreen that passes through a farm yard to terminate on the point of a peninsula. "War broke out between England and France in 1803 and because of past invasion attempts by the French, the British drew up plans to fortify likely landing places in Britain and around the coasts of Ireland. 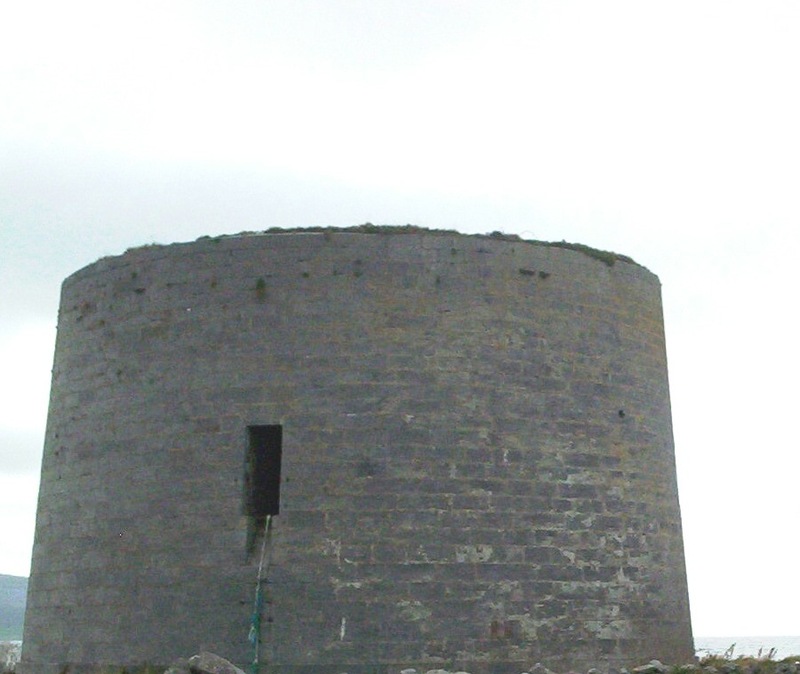 The principal feature being a network of fortifications to be constructed on the Coasts of England and Ireland was The Martello Tower Built under the National Defence Act 1804. 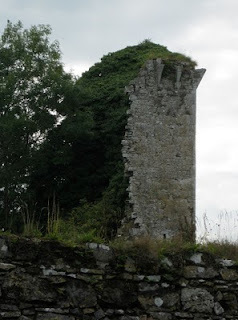 Here in Ireland 50 such Towers were built." Extracted from © www.martellotowers.ie"
Here I could be found in all weathers, standing in sunshine or sat with wind and rain to my back communing with nature, hearing the music provided by coastal seabirds against the wash of the sea lapping a stony strand. I loved the lonely isolation of it all. So it was here on one of my last visits that I took a stroll and found my heart. I did not know then that it was to be my turning point or the fulcrum of a new existence. An aorta in stone perhaps ? This heart shaped stone even has an indentation placed roughly where the aorta would be. This blog was inspired by an email conversation that I had with a follower of A Heron's View- HelenTilston: http://helentilstonpainter.blogspot.com who is a frequent visitor to a neighbouring Martello Tower on an adjacent peninsula, quite literally a couple of miles north in Co Galway.